This item has been introduced in E-Prime 2.0. 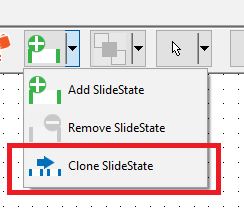 This feature allows for cloning (creating an exact copy) of a Slide's State, including the sub-objects. 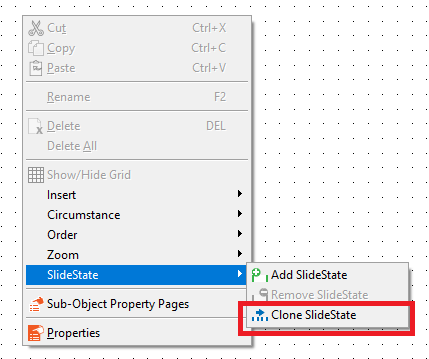 A unique name is generated which can then be changed and/or used in the ActivateState property of the Slide. Previous versions of E-Prime required creating a new SlideState, selecting the objects and then performing a copy/paste which did not copy the exact sub-object position nor the properties of the source SlideState. The images below show the two ways this feature can be accessed.